Back to a spot I enjoyed so much in 2014, Hyder, AK. I got here on Saturday. The salmon had not started running strong so there were few in the creek. Bears had been feeding elsewhere where the pickings were better. I went over to Fish Creek Sunday afternoon and soon after I arrived a black bear sow came through with her two cubs. She didn’t stick around long and the cubs were not easy to capture, they stuck close to the sow when they could and the brusk is very overgrown and thick. We did see another black bear one morning for just a very few minutes, it seemed rather tentative and didn’t stick around long. After several days of very brief sightings of black bears (maybe one per day) some of us early birds got to see a brown bear come down the creek. Not as early as some I arrived just in the nick of time. This boar is one I saw 4 years ago and is called Dawg Bear. There is a small lagoon near the start of the board walk, on the opposite side from Fish Creek. There is a creek feeding through it and beavers have decided the small outlet would be an excellent spot for a dam. The rangers have broken the dams up but the beavers persist. 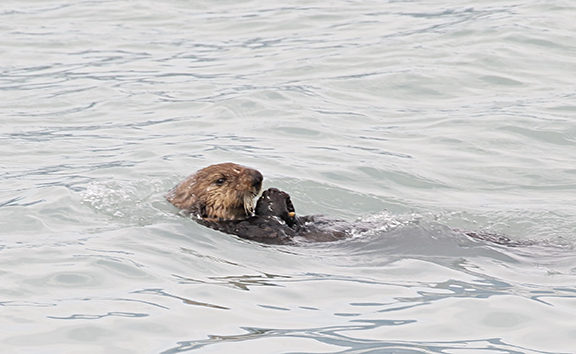 The really fun thing for me about the lagoon is that there are at least a couple of otter families that frequent it. One time there were 6 or 7 otters including a few pups there. I’ll continue to watch and photograph them. Another benefit of the dead fish the bears partially eat is that it attracts the mink. Mink are very elusive and fast but one morning we were able to watch a mink drag pieces of a fish into the brush and finally the rest of the carcass. My stay at Valdez was timed with the salmon run and the first night I was there they were in the weir with the seal lions catching them. As the days went and the run got stronger the sheer number of fish was amazing. Instead of filling maybe 1/3 of the area in front of the weir they totally filled it and you could look outside it and see them. There were also seals and sea otters in the area but none of them came into the weirs and they seemed to stay away from the sea lions. The sea gulls were everywhere, trying to grab bits of fish. Every day started out foggy but then it burned off by around lunch time. Early one evening I headed back up the highway to see if the light would be right on Bridal Veil Falls, sure enough it was and I even saw a rainbow in the falls. I found a good camping spot (no hookups) right across the road from the water and a very short drive to the weir. I made a few trips a day, sort of timed by the tides. High tide the sea lions would come in very close for the salmon, low tide I went further down the road to the large mud flats. That’s where the eagles hang out for the scraps. The ravens entertained us regularly, weren’t shy and were very vocal. They’re quite the characters! Jaws was in action nearly every day and is fattening up nicely (when I first started going to the viewing platform he was rather boney). I’ve noticed that the 2 sows seem to have shed their last year’s coats and both are nice and dark while the 2 boars still have lots of their old coat. Now we can see some of the dark hair and in time they will be dark and handsome. Too late for me, though. Last Thursday evening while I was at the end of the platform (everyone else had moved the other direction to follow a bear) a little bat flew around and hovered nearby. It didn’t seem put off by me and another lady so when he landed on the railing to enjoy a bug I grabbed my camera. It was quite accommodating and it made for a rare treat to photograph this critter. I left Hyder at lunchtime today (Aug. 15) and am in Smithers, on my way to Jasper. I met so many wonderfully friendly people while spending the hours at the bear viewing platform. Many have been going there for years, and others were newbies like me. Watching the bears was one common interest, with others the interest in wildlife photography gave us an added bond. Don’t know when if ever I’ll get back there but it sure would be fun!